In living-donor liver transplant, hepatic venous anomalies are not rare. Despite numerous techniques developed over the years, the best way of establishing a patent and durable hepatic drainage system remains controversial. We present a case where we successfully reconstructed 5 hepatic venous structures with a combination of direct anastomosis and saphenous vein interposition. Careful planning before surgery, and a customized approach for the patient on the back table, brought about successful results. Several available deceased-donor liver grafts compared with the ever-increasing transplant candidates, forces surgeons to consider living-donor liver transplant (LDLT).1 Although preoperative imaging studies allow suitable donor selection, the need for reconstruction remains an issue. Multiple techniques for venous reconstruction have been described over the years including end-to-side anastomosis, double vena cava technique,2 common large opening, and quilt venoplasty technique.3 The aim of this is to allow a patent and durable drainage system. We present a successful saphenous reconstruction combined with direct anastomosis. A 59-year-old woman with cirrhosis, with hepatitis B virus underwent a right lobe LDLT from her sister. Her Child-Pugh classification was C, and her model of end-stage liver disease score was 16. The donor was a 45-year-old woman who had undergone volumetric computed tomography, and the graft volume of the right lobe was calculated as 856 cc. It was compared with the total calculated volume (1342 cc), and it was 63% of the whole liver. Both the portal venous and the hepatic arterial anatomy were normal. Four major veins responsible for drainage of the right lobe were documented: a right hepatic vein, a segment V vein, a segment VIII vein, and 1 accessory right infrahepatic vein. Because of the anatomic structure, alternate donors were sought, but no one in the family was a suitable match for the recipient. Additionally, the condition of the patient, and the duration of time spent on the waiting list without a suitable match, resulted in selection of the donor. After a detailed explanation of outcomes of surgery, the patient gave written, informed consent. All protocols were approved by the ethics committee of the institution before the study began, and the protocols conformed with the ethical guidelines of the 1975 Helsinki Declaration. The donor was operated on with these findings. During dissection of the right lobe, all of the aforementioned veins were identified and prepared for the anastomosis. Additionally, another accessory inferior hepatic vein, coursing near the first one, was identified, it also was prepared for the anastomosis. At the back table, adjacent walls of accessory right infrahepatic veins were sutured with 6-0 polypropylene continuous sutures, so that 1 common orifice was created. For the reconstruction of segment V and segment VIII venous drainage, the great saphenous vein of the recipient was prepared, divided, and anastomosed to each stump with 6-0 polypropylene continuous sutures. 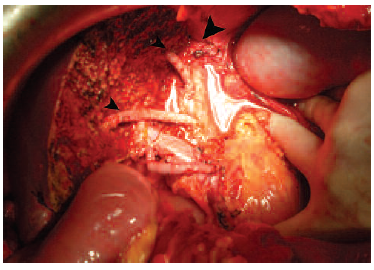 In the recipient, a total inferior vena cava clamping was performed. The middle and left hepatic vein stumps were closed, and the right hepatic vein stump was anastomosed to the graft right hepatic vein with 5-0 polypropylene. The reconstructed common accessory right infrahepatic vein stump was anastomosed in an end-to-side manner with 5-0 polypropylene. The saphenous grafts were shortened for optimal length and anastomosed to the body of inferior vena cava in an end-to-side manner with 6-0 polypropylene continuous sutures (Figure 1). After perfusion, no congestion or discoloration was observed. We monitored the patency of the reconstructed vasculature with repetitive daily Doppler studies during the first week. On the 15th day after surgery, a computed tomography angiography scan was performed, and all the anastomoses were found to be patent (Figure 2). During the early period, low molecular weight heparin was given to the patient; it was later switched to oral salicylic acid was used for anticoagulation. The patient was discharged 20 days after surgery, and continues to be well at the time of this writing (10 months). The donor was followed in the hospital for 1 week without any complications and then discharged. At the time of this writing (10 months), she is healthy without any symptoms. Having the main right hepatic vein and the accessory hepatic veins on the same plane allows the surgeon to perform a direct anastomosis to the recipient cava. That was possible in our case. If the veins would have been aligned on different planes, luminal occlusion would have been inevitable. The risk of luminal occlusion increases as the graft expands, but compression and occlusion of reservoirs, placed in other techniques, have been shown. When possible, creating a single outlet for 2 individual stumps offers 2 advantages: One is to cut and prepare a larger opening in the recipient’s vena cava; thus, having a larger anastomosis against occlusion. The other benefit is operative time. By performing half of the anastomosis on back table, the surgeon reduces the time spent on the recipient. With adequate exploration and handling of recipient vena cava, direct anastomosis of the inferior accessory hepatic veins offers the same advantages as other reconstruction techniques. Another important step in avoiding luminal occlusion is to properly choose the anastomosis site on recipient’s vena cava for saphenous elongation to prevent obstruction. An optimal length should be chosen that allows mobility while preventing stasis and thrombosis. Lo CM, Fan ST, Liu CL, et al. Adult-to-adult living donor liver transplantation using extended right lobe grafts. Ann Surg. 1997;226(3):261-269; discussion 269-270. Sugawara Y, Makuuchi M, Imamura H, Kaneko J, Kokudo N. Outflow reconstruction in extended right liver grafts from living donors. Liver Transpl. 2003;9(3):306-309. Hwang S, Lee SG, Park KM, et al. Quilt venoplasty using recipient saphenous vein graft for reconstruction of multiple short hepatic veins in right liver grafts. Liver Transpl. 2005;11(1):104-107. Lee SG. Techniques of reconstruction of hepatic veins in living-donor liver transplantation, especially for right hepatic vein and major short hepatic veins of right-lobe graft. J Hepatobiliary Pancreat Surg. 2006;13(2):131-138. Kim DG, Park SC, Moon IS, Lee MD. 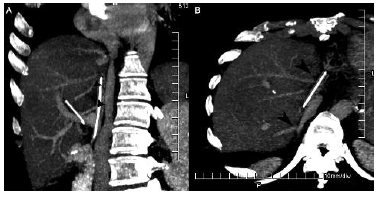 Reconstruction of three right hepatic veins using cadaveric iliac vein in right lobe living donor liver transplantation: case report. Transplant Proc. 2008;40(8):2523-2524. doi: 10.1016/j.transproceed.2008.07.022.